Today's smartphones can be used for so much — even making purchases. You can store your payment information — a credit card or debit card number — inside an app on your phone, like Apple Pay or Android pay — and use your phone to make payments wherever merchants have the capability. To complete a mobile payment, simply hold your phone near the point-of-sale terminal which reads your (encrypted) payment information stored on your phone and processes the transaction. In some ways, mobile payments are safer — it's more difficult for hackers to get access to your credit card details in a data breach. That's because your actual financial information isn't transferred during the transaction. Instead, a coded version of your credit card details is used to authorize payment. 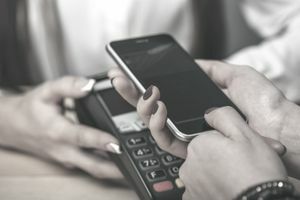 Even with the advanced security features, there are still some mobile payment safety tips to consider to ensure your financial information isn't compromised. If you're going to add your payment information in your phone, use the software that came with your phone — Apple Pay or Android Pay — or a trusted payment provider, like Google Wallet or Chase Pay, for example. Reputable mobile payment platforms don't store your actual credit card details. Fraudulent mobile payment apps created by hackers, on the other hand, can be created for the sole purpose of gathering your credit card details and can leave your information exposed. Be extremely cautious about using third-party mobile payment apps from the app store or downloaded from the internet. Not only should you be sure that you store your payment information in a trusted app, but be cautious about other apps you download to your device. Some could contain spyware or malware that's designed to capture your payment information and send it to hackers without you ever knowing. You can use Android Device Manager to lock or locate a lost or stolen cell phone by going to android.com/devicemanager. You can do the same for an iPhone by going to iCloud.com. And for a Windows device, go to windowsphone.com. First, make sure you're not carrying an unlocked phone. Without any security on your phone, a thief can quickly and easily get into your phone and access whatever personal and financial information you have stored. A strong password is one of the best ways to protect your phone and the information stored on it. Yes, that means your password has to be something stronger than “1234” or “password.” Don't ignore some of the other security features offered on the latest phones. Features like facial recognition, iris scan, and fingerprint unlock can be even more secure than a password or PIN. If you use a password or PIN to protect your phone, be wary of “shoulder-surfing,” where a criminal looks over your shoulder to watch you input your password. Any information passed through public wi-fi is accessible to everyone else who can access that wi-fi. That is anyone who has the know-how. That means your payment information can be intercepted if you're using your phone to make online purchases. You're safer using your phone carrier's cellular network or your home's password-protected wi-fi. Credit cards have much better fraud protection than debit cards. Most credit cards have zero fraud liability policies that eliminate your risk for any unauthorized charges made to your credit card account. With debit cards, on the other hand, there's a possibility of being liable for all the money taken from your account. Even if your bank will clear up the fraudulent charges, you don't want to have to wait for them to sort it out. If a thief gains access to your mobile payment information, it's (relatively) better for your credit card to be at risk than your debit card. Check your credit card transactions often, even if you have your phone in possession and you've used all the proper safety precautions. A thief who has gained access to your financial information through some other means — perhaps by hacking into a business you've made a payment with — can add your payment information to their mobile device and use it to make payments. Watching your account will allow you to detect any suspicious charges quickly. Report unauthorized charges to your credit card issuer. If you suspect that your credit card information has been compromised, you can receive a new account number and completely avoid any additional fraudulent charges.